Over a month of waiting has culminated in one very interesting episode of Arrow, kicking off the 2019 leg of the season in a big way. Spoiler alert: the new Green Arrow just happens to be a woman and Oliver’s long-lost half-sister. As if that wasn’t mind-blowing enough, Lyla (Audrey Marie Anderson) and Diggle (David Ramsey) were forced to reinstate the Ghost Initiative in order to explain why Ricardo Diaz (Kirk Acevedo) was in ARGUS custody. “The world is not a fair place. The people who are supposed to protect us are failing us,” new Green Arrow, Emiko Queen (Sea Shimooka), tells us in her opening monolog while crossing names off her own list. During her latest mission, Emiko broke into Talis Global to steal data, and also ended up taking a bullet upon her exit. She found Rene (Rick Gonzalez), who took her in and tended to her wounds. That brings us to parallel number one. It’s eerily similar to season one’s episode “The Odyssey” where Oliver (Stephen Amell) gets shot in almost the exact same spot and seeks out Felicity’s (Emily Bett Rickards) help. It seems that the Queen siblings have a thing for getting shot and looking for people they trust to help them. Also, am I the only one getting serious Olicity vibes from Rene and Emiko? Meanwhile, Oliver began his new job as a deputized member of the SCPD. His first case? An atypical Green Arrow B&E. 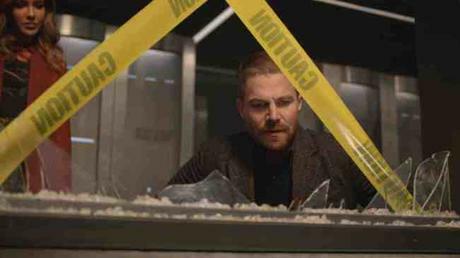 While helping Dinah (Juliana Harkavy) out, he discovered a bloody shard of glass, which she gave him to analyze because of the backlog at SCPD. He brought it home to Felicity, who, within moments of seeing the results, told him, “Can you sit down?” And that’s how Oliver found out that the new Green Arrow was not only a woman but Robert Queen’s daughter. Felicity suggested that Oliver reach out to his sister, but he figures that if she wanted to connect with him, she probably would have. From that point on, it becomes a mission for Oliver to discover as much about Emiko as he can before he reaches out to her. Felicity finds a storage unit Robert had been making payments for, even though the account is under Moira’s name. The boxes inside the unit are brought to their home, and after some rummaging, Oliver finds a letter that Robert wrote to Walter Steele, asking his long-time friend to take care of Kazumi Hadachi and the daughter he had with her in the event of his death. Side note: Kazumi Hadachi happens to be Shado Fe’s mother in the comics. Oliver becomes understandably pissed that Walter never got his father’s message and that the two women weren’t taken care of as they deserved to be. Not only that, he deems it unforgivable that Robert abandoned them in the first place. In the interim, Emiko eventually let Rene into her lair even after he barged into her latest mission. She briefed him on her personal mission, which was to get justice for her mother, who was murdered last year during a Glades tenement fire. Emiko traced the bullet to William Glenmorgan, but when she (with Rene and Curtis’s help) finally gets the drop on him in his own home, he vehemently denies her claims, saying he only recently returned to the country after a two-year mission abroad. In the flash-forwards, we find Zoe visiting the now cleaned-up Glades, where her father is Mayor. She tries to get Rene to give her access to the Archer Program, a security system now patrolling the Glades for crime, after telling him the news about the bombing schematics found at Felicity’s base of operations, but he refuses. And here comes the next big parallel. Is it just me, or does this seem like Malcolm Merlyn’s plan to level the Glades with his earthquake machine back in season one? Because the parallel is awfully similar. Back in season one, we saw Robert “die” during the sinking of the Gambit, only to find out he isn’t really dead, that he and Oliver and another crew member survived on a life raft. Could Felicity be alive and in hiding? There’s a strong chance that she is, and in my honest opinion, we probably won’t find out until the end of the season. And not only that but the mystery man described Star City as a “cancer”. I’m pretty sure we heard Malcolm say the same thing about the Glades in seasons past. So, the real mystery remains. Will Rene be forced into the same position as Moira was back in season one? Only time will tell. What did you think of the winter premiere of Arrow? Did you see any other parallels that I possibly missed? Comment down below and tell me your thoughts!